IF TREES COULD TALK. Some of the oldest, tallest, and thickest living organisms are gymnosperms, many of them residing in California. Redwoods live for thousands of years, and the Methuselah, a bristlecone pine, over 4,600 years old, is thought to be the world’s oldest tree. Coast redwoods sometimes exceed 360 feet (110 meters) in height, and the world’s tallest tree, the Stratosphere Giant, is 370 feet (113 meters). Fossil records reveal that the first gymnosperms appeared some 300 million years ago, 50 million years after the first seed plants, and provided nourishment for giant plant-eating dinosaurs. Although gymnosperms have been displaced for primacy in the plant world by angiosperms (flowering plants), which appeared 125 million years ago, conifers are more dominant and thrive at higher altitudes, in the colder climes of North America and northern Eurasia to the edge of the Arctic tundra, and under dry conditions. There are about six hundred conifer species, by far the largest group of gymnosperms, most of which are evergreens. Gymnosperms (“naked” seeds) are plants that reproduce by means of an exposed seed (ovule) usually found on modified leaves that form cones; by contrast, the seeds of angiosperms are enclosed in mature ovaries (fruits). As is typical of spermatophytes (seed plants), the plant body of gymnosperms has a stem, roots, leaves, and a vascular system with two conducting pathways: the xylem channels water and minerals from the roots to the shoots, and the phloem conducts organic materials manufactured in the leaves to the nonphotosynthetic parts of the plant. The gymnosperms are plants of great economic importance. Most of the commercial lumber in the Northern Hemisphere comes from the trunks of conifers such as pine, spruce, and Douglas fir, so-called softwoods, as does most plywood. Conifers are the source of essential oils, and their resins include derived turpentine, rosin, wood alcohol, and balsam. Some non-conifer gymnosperms are used as medicines including ephedra (the source of ephedrine), employed in China for thousands of years for respiratory disorders; Ginkgo biloba, claimed to be effective for the treatment of Alzheimer’s disease, high blood pressure, and menopause; and the anticancer drug Taxol, extracted from the yew bark. SEE ALSO: Land Plants (c. 450 Million BCE), Seeds of Success (c. 350 Million BCE), Dinosaurs (c. 230 Million BCE), Angiosperms (c. 125 Million BCE), Plant-Derived Medicines (c. 60,000 BCE), Paleontology (1796). 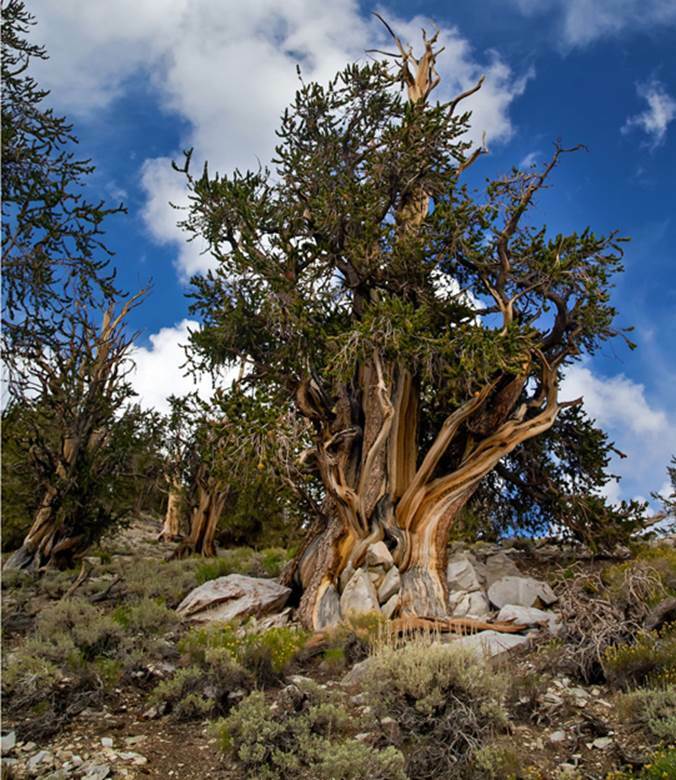 Ancient bristlecone pines, such as this one in the Inyo National Forest in California’s Sierra Nevada mountain range, are thought to be the oldest living trees. Their longevity, measured in thousands of years, has been attributed to their very dense, durable, and resinous wood that is resistant to insects and fungi.